(Bridgewater, N.J., March 26, 2018) - The Somerset Patriots have signed nine-year Major League veteran right-handed pitcher Logan Kensing for the 2018 season. Kensing enters his first season with the Somerset Patriots and second in the Atlantic League. 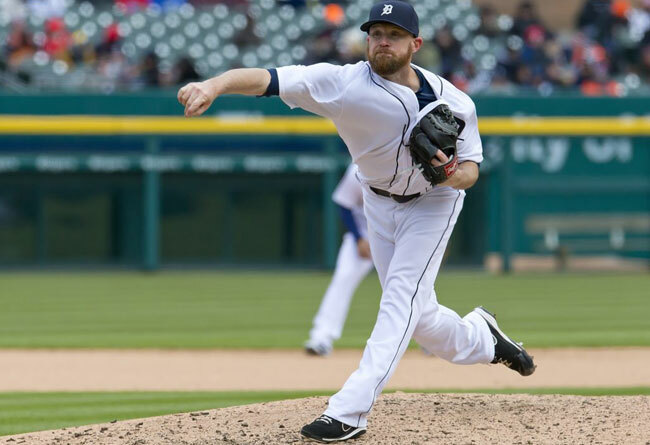 He has nine years of service at the Major League level, including five with the then-Florida Marlins and one with the Washington Nationals, Colorado Rockies, Seattle Mariners and Detroit Tigers, respectively. The former second round draft pick broke into the Majors in 2004 and made double digit appearances five different times. The San Antonio, Texas native struck out 45 batters over 37.2 innings pitched with one save in 2006 with the Marlins. He also enjoyed a strong 2008 campaign in Florida with three wins, a 4.23 ERA and 55 strikeouts over 55.1 innings pitched. Kensing carried a 1.93 ERA over his most recent stint in the big leagues with Detroit (2016). Overall, the 6’1” righty has won 10 games with two saves over 157 games (three starts) in the Majors. Kensing has pitched exclusively at either the MLB or Triple-A level in each of the past five seasons, including the last two with Triple-A Toledo (Detroit). Last year, he went 3-3 with a 2.54 ERA over 66 relief appearances. In fact, Kensing has not had an ERA higher than 3.58 in each of his last five seasons in Triple A. That also includes a 2.23 ERA over 19 appearances with Triple-A Tacoma (Seattle) in 2015. He owns a 3.29 ERA and 44 saves over 327 appearances (one start) at the Triple-A level. The Texas A&M University alum briefly played with the Bridgeport Bluefish in 2011. There, Kensing carried a 1.59 ERA over nine appearances before his contract with purchased by the New York Yankees. He owns a 34-31 record with a 3.41 ERA and 45 saves over 14 seasons in minor league baseball.